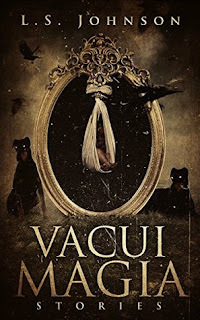 The title story, and perhaps the most heart-breaking piece in the collection (there is a lot of competition among the uniformly strong stories), “Vacui Magia” is paradoxically both written in the impersonal, hypothetical tone of a handbook, and delivered in the second person with the intensely personal and emotional impact that style brings. A list of instructions, with detailed recipes and warnings of risks and inevitable outcomes, for faking a pregnancy and baby to avoid disappointing a dying parent, this story unflinchingly presents the reader/protagonist with death, birth, lies, failure, the illusion of love, and the abandonment of hope. In common with “Little Men” perhaps, “Vacui Magia” is a story about the costs of magic, which, while unavoidable, may be so terrible as to be even worse than the problem it was used to overcome. I could talk about all of the stories in this collection, as they all deserve discussion at least to this length, but in the interests of a concise review, and to leave the reader to discover their pleasures herself, I’ll say only a few words about most of the pieces. “The Pursuit of the Whole Is Called Love” is the most science fictional story in the volume, and features as protagonist(s) a wonderfully sketched, inhuman and unfathomable alien species, but is also an allegory on love, partnership, compromise and loneliness; it is also full of brash, unlikeable and violent humans, who make the inhuman and predatory aliens look good. Another alienating protagonist populates “Germinant,” the story of a spoiled, perfect little girl who goes into a forbidden forest and is “damaged,” henceforth becoming invisible, poor, silent; she eventually builds the courage to return to the scene of her damage and loss for a form of rebirth. Set in Revolutionary France, one of the darkest historical stories is “Vendémiaire” (named after the month of the grape harvest in the Revolutionary calendar), in which a daughter has to deal with the failure of her family’s vineyards after her powerful mother betrayed both them and the whole village for a “horned devil;” when a Revolutionary agent comes from Paris to reclaim the land, the mother’s horned child is in danger of getting caught in the crossfire. “This Is How You Lose Yourself” is a prose poem, rich, powerful, sometimes confusing, a short tale of cyclic horror that is better read than summarised. A more beautiful story is “Clotho,” another allegory of the three Fates, maiden, mother and crone, powerlessly weaving the threads of people’s lives; the young daughter’s passionate but ultimately unreal love is not able to break the pattern of their fates. The collection then closes with another epic, heartbreaking and horrifying historical story. “Julie” is equal parts tragedy and meta-fiction, as the eponymous protagonist, an innocent country girl brought to Paris to be the fancy woman of a debauched, but poor, reverend, eventually whored out by him, and has her story and identity stolen by an abusive Jean-Jacques Rousseau, who becomes rich and famous off her suffering. The powerless and broken Julie’s eventual revenge against the craven writer, assisted by an ancient mythical figure who may or may not exist outside of her imagination, ultimately costs her more than it does her good, which is both the way with revenge (“dig two graves”) and typical of the stories in this volume, wherein magic and fantasy may empower and embolden, but they do not change the balance of power or create happy endings. There is a certain savage beauty in the conclusion to this story, however much we might wish for Julie to find a happier end. I can say without hesitation, reservation or exception that this is a collection full of brilliantly written and powerfully affecting stories, each of which profoundly impressed me in different ways. I cannot say that I always enjoyed reading it, as the content is often dark and upsetting, but it is by no means an unremittingly depressing read. There is a joy in the magic, a grandeur in the invention, a sense of living, of choosing a savage and costly outcome rather than living on in safe drudgery on one’s knees. And, like the best of horror and fantasy writing, the terrors and monsters and atrocities that we suffer teach us about ourselves, they are a form of catharsis, an imagined violent response to injustice that better enables us to stand up and respond forcefully, unflinchingly (if hopefully less viciously) against injustice and suffering. Johnson’s Vacui Magia is a book that never goes quietly, and it is wonderful for it.